BANKSVILLE, N.Y. – There's a lot that goes into operating a successful fire department and having plenty of people to staff various positions is vital. "Recruitment and retention is number one on the list for us right now, that's a top priority," Banksville Fire Chief Al Farquhar said. "It's right with training to keep everyone up to date with everything, like training." 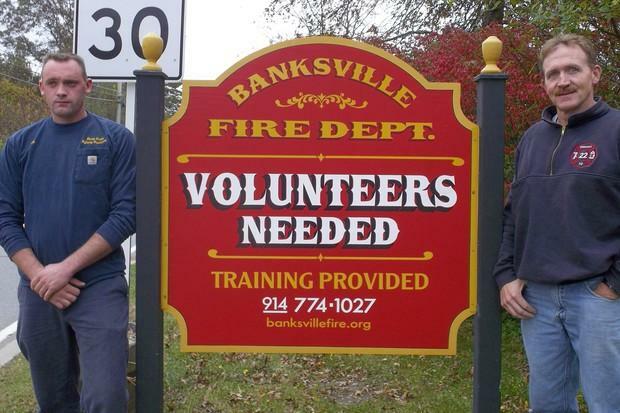 Banksville Fire Department, like all volunteer fire companies, is constantly looking for people to help out, both at the fire house and on calls. "If we get five people to volunteer their time that would be a big help," said former Chief Walter Watson. "They don't have to be interior, structural firefighter's; they don't have to go into burning buildings. We need people who are willing to help us outside setting up water supply, directing traffic, monitoring the safety of the firefighters; there's a lot of different roles people could take." Residents who decide to volunteer would go through a simple process of filling out an application, having a medical evaluation, and complete some 'in-house' training. Then within the first year they'd have to enroll in the state firefighter program which is held at the county training center. Once they complete that training program there's ongoing training that has to occur on an annual basis to meet various regulations and keep skills sharp. "We cover different stuff monthly to keep our skills sharp," Farquhar said. "Lately we've been going back to the basics like hose-line advances, ropes and knots, and water supply drills just to keep our skills up." Watson said for volunteers that decide they'd like to climb the ranks, there are classes available to become officers, drivers, or emergency medical technicians. Farquhar and Watson always stress that any person of any occupation could be of help to the fire department. "Whatever occupation you have, you can volunteer," Watson said. "Even if you don't have an occupation and you're a stay at home mom or dad. If you've got some time while your kids are at school, that's perfect, there's a place for you." "We always have paperwork to be filed and stuff like that so we have a place for you if you have the time," Farquhar said..
People who would like information on volunteering can visit banksvillefire.org. "If you see us out on a call or at the firehouse, stop by and talk to us and we'll explain how you can help us," Watson said.